Book DescriptionBuilding and maintaining an opening repertoire can be a demanding task - for a start there are an enormous number of different lines to choose from. There's a strong temptation amongst beginners and improving players to opt solely for tricky lines in order to snare unsuspecting opponents, but this approach has only short-term value. As you improve and your opponents become stronger, very often these crafty lines don't stand up to close scrutiny, and suddenly you're back to square one with no suitable opening weapons. In 'Starting Out: 1 e4!' Neil McDonald solves this perennial problem by providing the reader with a strong and trustworthy repertoire with the white pieces based on the popular opening move 1 e4. The recommended lines given here have stood the test of time and are regularly employed by Grandmasters. Reading this book will give you the confidence to play these variations against all strengths of player and provide you with reliable opening armoury for years to come. 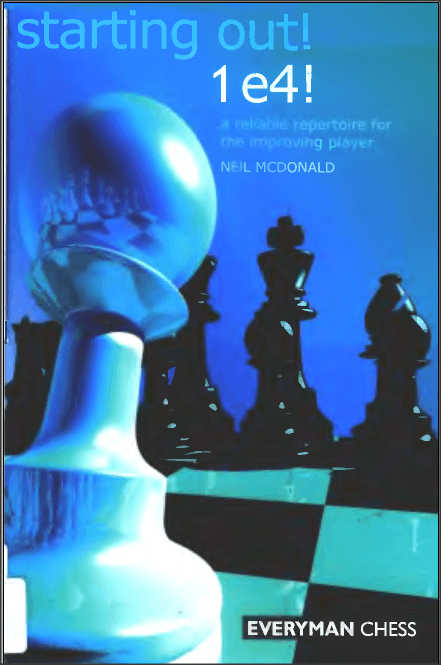 This book is written in 'Everyman Chess' distinctive 'Starting Out' style, with plenty of notes, tips and warnings throughout to help the aspiring player. Presents a Grandmaster-style opening repertoire, written by a 1 e4 expert that is ideal for improving players. About the Author: English Grandmaster Neil McDonald is an experienced and successful player on the international chess circuit. He is a respected chess coach, who has trained many of England's strongest junior players. McDonald is also a talented chess writer and has many outstanding works to his name. He is resident of the UK.